Pastor Joshua Vijayakumar runs a church planting ministry in India. To be more precise his vision is to plant churches that plant churches. 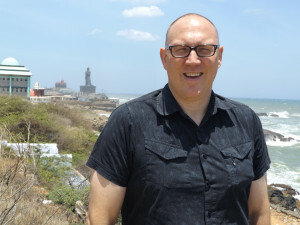 Along with the Evangelical Church Growth Mission he runs the Timothy Training Association which runs groups around Tamil Nadu and across India. Therefore as we drove down to the very tip of India (the beach front at Kanyakumari) we stopped at a TTA meeting on the way down (I had to preach … of course 🙂 ) and then had lunch by the sea. To prove I got that far south one of the photos is of me in front of the Thiruvalluvar Statue – a 133 feet tall stone sculpture of the Tamil poet and philosopher Tiruvalluvar, author of the Thirukkural. It is located atop a small island on the southernmost Coromandel Coast, where two seas and an ocean meet; the Bay of Bengal, the Arabian Sea, and the Indian Ocean. The statue is 95 feet tall and stands upon a 38-foot pedestal that represents the 38 chapters of “virtue” in the Thirukkural. The combined height of the statue and pedestal is 133 feet denoting the 133 chapters in the Thirukkural. 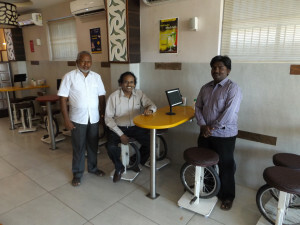 Then, on the way home in the afternoon, we stopped for coffee with two local,pastors in Tirunelveli. These two men are a real life Paul and Timothy and a perfect example of Joshua’s ministry. ‘Paul’ was converted from a family of Hindu priests in 1982. He is the Pastor of a small church locally and is mentoring ‘Timothy’ who has more recently planted a church of his own. Their own stories are very familiar to me by now and demonstrate that God is, in general, working from the bottom of India upwards. One testimony of being delivered from demonic possession is complemented by another of leaving because of a terrible father. Both men found Christ as they reached rock bottom. Similarly the church in India has seen most growth amongst the dalits and the lower castes. As I listened to the situation in their churches I was reminded again of the early church. Both of them lead churches that are mostly made up of women. The common testimony is one of an abusive husband who drives his wife to tears and then to Christ. (One of the prayer requests was they would increasingly reach men too.) This all sounds very similar to Peter’s first letter. It seems that the early church grew (in the first few centuries at least) especially among women, slaves and those of lower status in the ancient world. Joshua shared how much of a barrier the caste system is to church growth in India. His church planting strategy is a good one regardless of context but it is essential in India. If someone because a Christian only people from their own caste will listen to them. Lower castes will not listen to a message from the upper castes and vice versa. Therefore Joshua encourages people to plant as many churches as possible in their own castes. This has given me much to think about since, generally, the church in the UK appeals to the middle classes. Next week I hope to try and put some of these issues together as I try to make some more direct applications back home.